Product prices and availability are accurate as of 2019-04-14 07:05:20 UTC and are subject to change. Any price and availability information displayed on http://www.amazon.com/ at the time of purchase will apply to the purchase of this product. Large 6x3 inch Pro-Quality Testing Stone This large glass test stone includes a rubber grip backing. This test stone measures 6" x 3" x 1/4" *YOU CAN TEST SEVERAL PIECES AT ONCE WITH THIS EXTRA LARGE TEST STONE! * (Test Stones are used to test your gold jewelry without actually testing on the piece itself and ruining it. 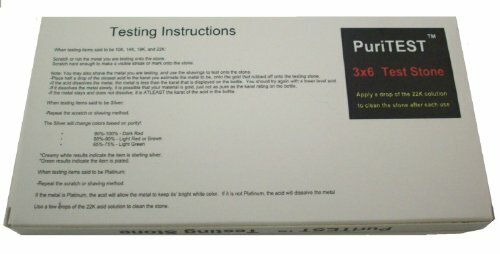 Instead you apply the acid to a mark that you rub on the test stone.) This stone allows to to test quicker by allowing you to test many items all at the same time! Smooth Black Glass Surface for easy reading of the test acids on this stone. Non slip pad on back to keep stone from sliding or scratching on table surfaces Large 6x3 tesing surface make it easy to test several items at once. This stone is used in conjunction with Gold test acids to determine if solid gold and karats Test stones are used to test your gold jewelry without ruining it, by using the stone to test instead of directly on the piece.